National Council Internship Program participants visited the Royal Embassy of Saudi Arabia to receive a briefing from Mr. Nail Al-Jubeir, Director of the Embassy’s Information Office. 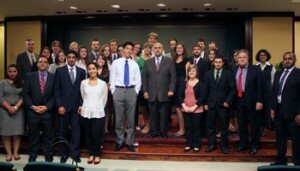 The National Council on U.S.-Arab Relations’ Model Arab League/Arab-U.S. Relations Youth Leadership Development Program has been linked for many years to the Council’s Annual University Student Washington, DC Summer Internship Program. The Summer Intern Program’s participants are alumni of the Models and other rising young American and Arab leaders of tomorrow. U.S. Ambassador (Ret.) Edward Gnehm made it possible for the 2012 program to be administered again in association with The George Washington University’s (GWU) Institute for Middle East Studies in the Elliott School of International Affairs. 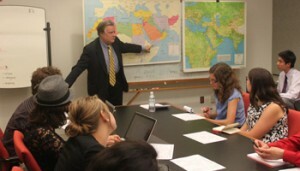 Ambassador Gnehm is a member of the GWU faculty where he is the Kuwait Professor of Gulf and Arabian Peninsula Affairs. As in previous years, the 2012 Internship Program provided fertile training ground and an invaluable firsthand professional work experience for young American leaders interested in a career devoted to improving U.S.-Arab relations. The program, which lasted from May 29 – August 3, provided 25 students an opportunity to work in the nation’s capital at 18 organizations involved in one way or another in efforts to improve Arab-U.S. relations. 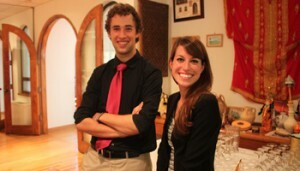 The experience is one that could not possibly be duplicated or paralleled by the students’ university studies on campus. In addition to their time assisting with the office routines of their host organizations, the interns met and were briefed as well as mentored several times a week by some of America’s most renowned specialists in international relations as they pertain to the Arab world. By design, the primary focus of the academic component of the program centers on a sub-region of the Arab countries, the Middle East, and the Islamic world: Arabia and the Gulf. The reason relates to three truisms. Each one has implications for American and other countries’ needs, concerns, interests, relations, and key foreign policy objectives. First, this particular region, together with its maritime and aviation routes, has long been regarded globally as the epicenter of the most strategically and economically vital energy resources that drive the engines of the world’s economies. Second, Arabia and the Gulf remain front and center among some of the most pressing international issues relating to war and peace as well as world economic growth. Indeed, it is the one part of the planet more than any other to which, on three separate occasions, extraordinarily large numbers of American and other foreign armed forces have been mobilized and deployed in the past quarter of a century. Third, the ongoing importance to much of humankind represented by these nine countries – Bahrain, Iran, Iraq, Kuwait, Oman, Qatar, Saudi Arabia, the United Arab Emirates, and Yemen – is undeniable. Despite this, the number of Americans who specialize in this sub-region and its member states, or can legitimately claim to be well-informed about the external and internal political dynamics of these countries, remains exceptionally limited. 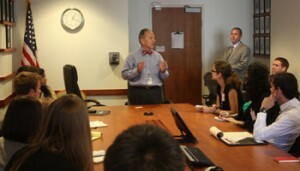 National Council Internship Program participants visited and were briefed by diplomats at the U.S. Department of State. Intern program participants visited the Embassy of Bahrain to receive a briefing by H.E. Houda Ezra Ibrahim Nonoo, Ambassador of Bahrain to the U.S. Accordingly, one of the program’s objectives is to increase the number of foreign affairs practitioners that are as knowledgeable of Arabia and the Gulf’s internal and external dynamics as possible. To that end, most of the lectures address issues related to the member-states’ systems of governance, political realities, economic and social development, and their foreign relations, on one hand, and, on the other, the relationships of the United States with this Arab sub-region and its neighbors — and vice versa. Internship Program alumni currently serve as senior diplomats in American embassies in the Arab world, in U.S. government executive branch agencies as well as Congressional committees dealing with U.S.-Arab policy issues, major national and international print as well as broadcast media, leading American corporations engaged in U.S.-Arab trade, investment, technology cooperation, and the establishment of joint commercial ventures, and as teachers of Arabic and Arab area studies in American universities. 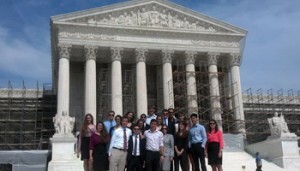 The interns visited the U.S. Supreme Court during one of their weekly excursions that allowed them to explore some of the unique institutions in the nation’s capital. The Arab-U.S. relations programs, activities, and functions represented by the eighteen organizations and corporations that provided the professional work experience component of this year’s program are varied. Included among their missions and activities are educational development and exchanges, bimonthly and quarterly publications, humanitarian relief services, public broadcasting, academic area studies, international transportation, foreign trade, and peace and justice advocacy. An additional feature of the Internship Program is site visits to public and private sector institutions such as Arab embassies, energy corporations, congressional committees, and government agencies. Administering the 2012 program were National Council President Dr. John Duke Anthony as Chairman and lead lecturer. Director of Student Programs Megan Geissler served as Coordinator, assisted by staff members Josh Hilbrand, Byron Lewis, Colin Moore, and Mariam Klait as Assistants. Included among the many lecturers were The Honorable Molly Williamson, former Senior Foreign Policy Adviser to the Secretary of Energy, former Deputy Assistant Secretary of Commerce, and former Deputy Assistant Secretary of Defense and State; Mr. Abed Ayoub, Legal Director of the American Arab Anti-Discrimination Committee; Mr. Afshin Molavi, Senior Advisor for Oxford Analytica, Columnist for The National, and Alumnus of the National Council on U.S.-Arab Relations Morris Arab World Journalism Program; H.E. Maen Rashid Areikat, Palestinian Ambassador to the U.S.; Mr. Bill Corcoran, President of American Near East Refugee Aid; Mr. Nail Al-Jubeir, Director of the Information Office at the Royal Embassy of Saudi Arabia; Mr. Luyen Tran, Director of the Middle East and North Africa Office at the U.S. Department of the Treasury; Ms. Courtney C. Radsch, Senior Program Manager at Freedom House; H.E. Houda Ezra Ibrahim Nonoo, Ambassador of Bahrain to the United States of America; Mr. Laith Ulaby, Facilitator at Soliya; Mr. Aaron Snipe, Spokesperson and Deputy Director in the Bureau of Near East Affairs at the U.S. Department of State; Ambassador James Larocco, former U.S. Ambassador to Kuwait and Current Director of the Near East South Asia Center for Strategic Studies; H.E. Dr. Mohammed Alhussaini Alsharif, Ambassador of the League of Arab States to the U.S.; Ms. Camille Elhassani, Senior Producer at Al Jazeera English; and Lieutenant Colonel Abbas Dahouk, Middle East Foreign Area Officer in the U.S. Army. This entry was posted in NCUSAR.